Hot off the presses! SUPER SIMPLE QUICK START GUIDE TO SELF-PUBLISHING by award-winning bestselling author E.J. Stevens is available now! This simple introductory guide will give you the basic information you need to begin self-publishing. Whether you are writing your first novel or looking to breathe new life into your backlist, this guide will give you the tools you need to successfully self-publish. Useful information, direct links to resources, checklists, and step-by-step tutorials will help you create a professional quality book. Simple tips will save you time that you can spend on writing, publishing, and promoting your next bestseller. Each chapter will take you one step, leap, or bound closer to successfully publishing your book. Grab your cape. It's time to be an indie publishing hero! Looking to improve book sales? 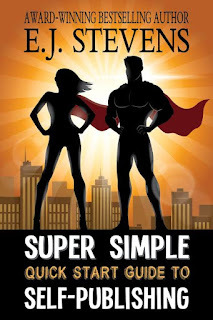 Check out the Super Simple Quick Start Guide to Book Marketing by E.J. Stevens. Welcome to the Super Simple Quick Start Guide to Self-Publishing. Whether novice or experienced writer, I hope you find this book helpful as you embark on your publishing journey. My goal is to provide you with an easy-to-follow guide that will save you time and money through tips and tricks I’ve developed during my writing career. This guide is arranged in the order in which I publish my own books. Each chapter will take you one step, leap, or bound closer to successfully publishing your book. Early chapters introduce concepts vital to getting your book published, and give a simple tutorial on how to complete that step, saving you valuable time. Pro tips and publishing life hacks will highlight ways to avoid common pitfalls. Later chapters provide information on what to do after your book launch, including how to make your book available in additional languages and in the increasingly popular audiobook format. At the end of this guide, you’ll also find a publishing checklist and a list of useful resources. I have successfully published 15 fiction books, including the award-winning Spirit Guide young adult series, the bestselling Hunters’ Guild urban fantasy series, and the award-winning, bestselling Ivy Granger, Psychic Detective urban fantasy series. In 2017, I will release my first works of nonfiction, the Super Simple Quick Start Guide to Book Marketing and this Super Simple Quick Start Guide to Self-Publishing. In addition to my 2017 nonfiction releases, I will be publishing two more books in the Ivy Granger series and two books in the much anticipated Whitechapel Paranormal Society Victorian Gothic horror series. In recent years, my books have won numerous awards. I am a BTS Magazine Red Carpet Award winner for Best Novel and Best Book Cover, SYAE finalist for Best Paranormal Series, Best Novella, and Best Horror, winner of the PRG Reviewer's Choice Award for Best Paranormal Fantasy Novel, Best Young Adult Paranormal Series, Best Urban Fantasy Novel, and finalist for Best Young Adult Paranormal Novel and Best Urban Fantasy Series. My novels and novellas have been translated into multiple languages, including German, Italian, Spanish, and Dutch. I have also had the pleasure of working with world famous voice artists in the production of over a half dozen audiobooks. My books have flown to the top of the Amazon bestsellers lists in numerous categories. I have repeatedly hit the Amazon top 100, and have hit #1 in a variety of categories such as the Mythology & Folktales > Fairy Tales category and the Mystery, Thriller & Suspense > Psychics category in Amazon stores worldwide. I am a guest at conventions and book signings around the world. Recent conventions include Dragon Con, Boskone, Imaginarium, Readercon, and World Fantasy. I frequently speak on panels and teach workshops on a wide range of publishing, writing craft, and literary topics. I have been a guest speaker alongside such notable figures as Charles Stross, Catherynne M. Valente, Orson Scott Card, Rachel Vincent, Paul Tremblay, Maria Snyder, Leanna Renee Hieber, David Coe, Kit Reed, Peter V. Brett, Jacqueline Carey, and Max Gladstone. It’s important to remember that I did not start out as a publishing hero. I’ve made mistakes, ones that you don’t have to make if you follow the steps in this guide. When I started publishing my books in 2009, there were limited resources in libraries and online. I was frustrated by conflicting information, outdated books and websites, dead links leading to 404 errors, and false information posted by people with no industry experience. Today there are hundreds of books, videos, and websites on how to publish and market your book. This wealth of resources is great in theory, but it means that it has become more difficult to find useful information than ever before. With my years of publishing experience, I can shine a light on the most important tasks, help you set clear goals, and provide tips to ensure you achieve those goals. The Super Simple Quick Start Guide to Self-Publishing will give you the basic information needed to independently publish your book, while providing terminology and resources that will help if you wish to learn more advanced publishing skills. Grab your cape. It’s time to be a publishing hero! BTS Red Carpet Award winner for Best Novel, SYAE finalist for Best Paranormal Series, Best Novella, and Best Horror, winner of the PRG Reviewer's Choice Award for Best Paranormal Fantasy Novel, Best Young Adult Paranormal Series, Best Urban Fantasy Novel, and finalist for Best Young Adult Paranormal Novel and Best Urban Fantasy Series. When E.J. isn't at her writing desk, she enjoys dancing along seaside cliffs, singing in graveyards, and sleeping in faerie circles. E.J. currently resides in a magical forest on the coast of Maine where she finds daily inspiration for her writing. Join the E.J. Stevens newsletter and learn about news, events, and ghosts. Monthly news updates, tour photos, and exclusive reader perks (FREE reads & giveaways!). Great resources for authors on E.J. 's "Author Resources" page on her official website. Get this WICKED preorder now!